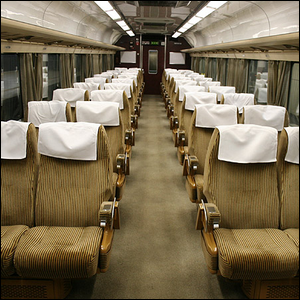 The Square Of Cloth Found On The Headrests Of Many Airplane and Train Seats Is Called? In Victorian London Residents Enjoyed Up To A Dozen Deliveries Of What Per Day? Language and culture are curious things and they often collide in ways that give us words that long outlive the things that inspired them. Such is the case with the archaic name for the small squares of cloth you find on the seat headrests of many airplanes, trains, buses, and other places: the “antimacassar”. It’s a very strange name for something you would assume had a very simple and straightforward name like “oil guard”, “head pad”, or the like. While the purpose of those little fabric squares is to protect seats from hair oil and dirt in a way that extends the life of the upholstery, it came into existence because of a specific hair treatment: macassar oil. It was highly fashionable for men to groom their hair in the Victorian and Edwardian eras with oil, typically made from coconut oil or palm oil blended with ylang-ylang oil and other fragrant oils. It was known as “macassar oil” due to the widespread belief that it was made with ingredients purchased from the port of Makassar in Indonesia. The trend was so popular and the oil laid on so thick that it would bleed off men’s hair and onto the upholstery of chairs. This led to housewives covering the arms and backs of their chairs with washable cloths to prevent the fabric coverings from being soiled, thus the name antimacassar. While the fashion of greasing one’s hair has long since gone out of style, the utility of protecting chairs from soiling (especially in frequently used locations like train cars and airplane cabins) has not, and the use of antimacassars persists to this day.